With access to over 300km of exceptional ski runs within the Espace Killy; Tignes comprises of five interconnected villages at varying altitudes which are well connected by both bus and piste. Val Claret sits at 2100m and the snow park and half-pipe close to the town have previously played host to the Winter X-Games, British Championships, and Navy Ski Championships. Le Lac is generally considered to be the main part of Tignes centred around the lake area. Hosting plenty of bars and restaurants, Le Lac offers much of the apres-ski entertainment in town. Lower in the valley and below the impressive dam sits the village of Les Brevieres, which generally has a quieter, more traditional atmosphere perfect for families. 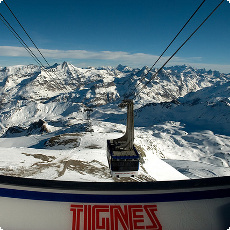 Tignes is a high-altitude resort with one of the best snow records in Europe and the Espace Killy is regarded as one of the best ski areas in the world for both easily connected pistes, as well as lift accessed off-piste runs. The 3000m Grande Motte glacier also offers year-round skiing, and is easily accessed by the underground funicular train in just seven minutes. Away from the slopes there are a good selection of restaurants and bars scattered around all the villages as well as four nightclubs that stay lively until the early hours. There is also a sports centre with swimming pool, ice-skating available on the lake, bowling, as well as dog-sledding and ice-diving for those who want to try some alternative winter activities. Shared transfers between Geneva airport and Tignes ski resort offer a great value method of travel for individuals and small groups of travellers. With regular scheduled buses running throughout Saturdays and Sundays, as well as routes on Fridays and Wednesdays - cheap transfers are available from just £49pp. Snowbus coaches stop at Tignes Les Brevieres, Tignes Le Lac and Tignes Val Claret (including for Tignes UCPA) and represent one of the most cost effective ways of getting from Geneva airport. Private taxi transfers are also available at any time of the day, seven days a week. Grenoble airport shared transfers are available on Saturdays throughout the ski season. With regular departures and convenient stops at Tignes Les Brevieres, Le Lac and Val Claret our cheap shared transfers are a perfect way of travelling from Grenoble. Private taxis and minibuses also operate from Grenoble airport and will take you directly to your hotel door (and vice-versa) for the quickest travel method. Although small, Chambery airport is the closest arrival point for travelling to any of the Tignes resorts. Snowbus can arrange private transfers between Chambery and Tignes for any size group of holidaymakers - from 1 to 60 passengers. Transfers are arranged around your flights so you spend the minimum amount of time on the journey and the maximum amount of time in the amazing ski resort of Tignes. Private taxis and minibuses are available between Lyon airport and Tignes at any time and on any day of the week. Snowbus’ comfortable vehicles will take you straight from your flight and get you to your hotel or chalet in Tignes in the quickest time possible. Perfect for families and groups of friends, our private travel can be arranged for any size group - large or small.